Love・Trap・Rainbow Flandre (恋・罠・虹フランドール, Koi・wana・nijifurandoru) is a 2 disc Flandre Scarlet theme doujin album by pikapika released on 2017-05-07 (Reitaisai 14). It features vocal arrangements of themes from Embodiment of Scarlet Devil and Subterranean Animism. 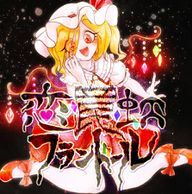 The album is themed around Flandre Scarlet and overwhelming features arrangements of themes associated with her, in addition to a small handful of others, it is primarily composed of new arrangements but a handful of songs that have either been re-recorded, remastered or remixed are also featured. The album features a greater number of contributors than previous releases as a result of being a double album which features several redone arrangements, but more than a quarter of the album's tracks were notably contributed by もちとん of mochi_season. ↑ Track 02.STRANGE LOVE is a remastered version of an arrangement originally titled "ストレンジラブ" from the album 紅ベビィドォル released in 2013. ↑ Track 05.Let's play a game is a re-recording of an arrangement from the album BABy,LoLLiPoP released in 2013. ↑ Track 08.Immortal is a re-recording of a track originally featured on the album Chocolate Pain released in 2012. ↑ An alternate instrumental version of track 10.IRIS titled "iris" was featured on the album contact released in 2017 by Retractable. ↑ Track 12.デウスエクスマキナ RainTranceRemix is a remix of an arrangement from the album デウス・エクス・マキナ released in 2015. ↑ Track 13 "アコースティックレイン" is a redone version of an arrangement from the album アコースティックレイン released in 2012. ↑ Track 19 "おもちゃのゆめ" is a re-recording of an arrangement from the album ワールド・エンド・ファナティック released in 2014. This page was last edited on 1 February 2018, at 23:04.